Not blessed with an inherent position the way state-owned carriers are, Hainan Airlines has had to turn to improvisation and creativity. 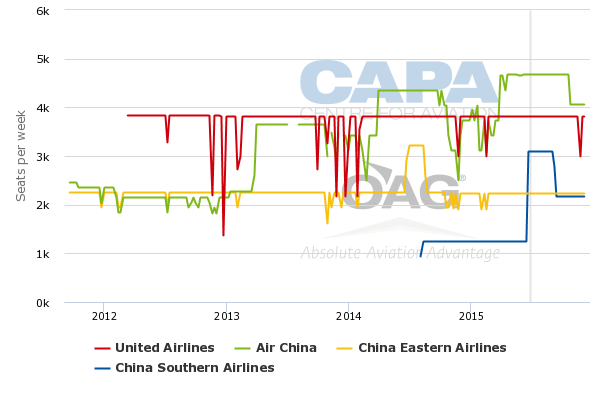 Fellow Beijing carrier Air China holds traffic rights for lucrative long haul routes so Hainan Airlines had to look for secondary markets like Boston and San Jose although there were blue chip wins like Chicago and Toronto, which Air China had neglected. But the markets of New York and Vancouver have been too important to pass over. After proposing a number of ideas to serve New York, Hainan Airlines instead plans to open a long haul base in Tianjin to serve New York and Vancouver from Jun-2016. Beijing would of course have been preferable, but neighbouring Tianjin has potential. It is near Beijing with a high speed link into the city, and Hainan Airlines will have some feed from locally-based sister carrier Tianjin Airlines. The Tianjin long haul base follows primary long haul bases of Beijing and the recent opening of Shanghai Pudong. Hainan Airlines has filed an application with China's regulator the CAAC to open daily Shanghai Pudong-Tianjin-New York JFK 787 services and five weekly Tianjin-Vancouver A330 services. Although there is a chance the services may not proceed, generally by the time the CAAC makes applications public there is a high degree of certainty. Hainan's long-haul network is largely a compact 787-8 operation. Hainan now has all 10 of its original 787-8 order. A Mar-2015 order for 787-9s will mean Hainan takes a total of 32, with some arriving as early as 2016. Hainan had a few widebodies before its 787s, so moving from 10 787s to a further 32 indicates the potential Hainan sees for growth. Selecting the larger 787-9 reflects both higher demand and better cost dynamics. The 787-8 was low-risk given its small size but Hainan has found it needs better scale. Hainan would probably prefer Vancouver to be a 787 route, but given limited aircraft the shorter routes will be served with A330s, where the 787's cost advantage is not as strongly felt as on longer sectors. Likewise Hainan Airlines has moved Beijing-Seattle service from 787 to A330 to re-deploy the 787. In Jul-2015, the top mainland North American destinations for Chinese carriers are Los Angeles, New York JFK and Vancouver. There is a wide spread in terms of popularity as the fourth most popular point, San Francisco, has less than half the seat capacity of Los Angeles. Hainan has been absent from the top markets but in 2015 has started to partially close the gap. The San Francisco area is served via a flight to San Jose as Hainan could not secure San Francisco rights due to Air China's existing service. Los Angeles is due to be opened in Jul-2015 with twice weekly 787 service from Changsha, a smaller city and likely providing substantial incentives and possibly even subsidies. The potential of a Hainan Los Angeles service from Changsha and only twice weekly may put Hainan in Los Angeles but not on the same calibre as China Eastern or Air China, the latter with upwards of three daily flights. New York has risen in popularity with recent China Southern service and expansion from Air China. China Eastern expects to grow in New York as well. Hainan for some years has looked at how it can serve New York, which like Los Angeles was off-limits due to Air China's existing service. Hainan thought it could avoid direct overlap with Air China by triangulating New York with Toronto or serving nearby airport Newark, but these ideas were apparently rejected. In Dec-2013, Hainan received indications it could apply for Beijing-Newark and Beijing-Mumbai-Nairobi service with the caveat that the two would be jointly approved and Hainan would need to serve Nairobi in order to serve Newark. China had been trying to increase air links with Africa but other Chinese airlines were uninterested or able to resist pressure, so Hainan was given a quid-pro-quo situation. Ultimately Hainan did not launch either service. Nairobi would likely have been too loss-making to offset any gains from the Newark route. Vancouver becomes the only North American point that will be served by all five of China's long-haul operators. Sichuan Airlines only serves Vancouver in North America. Only two cities – Los Angeles and New York JFK – are planned to have service from the remaining four Chinese carriers. Hainan's recent developments could see it serve more North American cities than Air China, but Hainan's network will be more fragmented and focused (not exclusively) by necessity on secondary points that support limited frequency. Hainan's planned routes would give Tianjin its first long haul (intercontinental) services, making it another of China's secondary cities to have intercontinental flights. Tianjin's longest service is the 4,410km sector by Scoot to Singapore. Hainan's services will nearly triple Tianjin's reach from the 4,410km Scoot Singapore sector to 8,562km to Vancouver and 11,099km to New York JFK. Scoot serves Tianjin as an alternative to Beijing. Slots are an issue at Beijing and Scoot effectively leaves Beijing to its full service parent Singapore Airlines. AirAsia X had served Kuala Lumpur-Tianjin but switched the service to Beijing when slots and commercial factors aligned. AirAsia X's switch from Tianjin to Beijing reflects Tianjin largely being in the shadow of the Beijing market rather than having its own strong local market. Hangzhou for example is near Shanghai the way Tianjin is near Beijing, but Hangzhou has a large local market (airlines including AirAsia X and KLM serve Hangzhou in addition to Shanghai). There is a high speed train connecting Tianjin and Beijing in about 90 minutes, but a bus is required to transit from Tianjin airport to the train. This makes Tianjin airport to Beijing airport transfers convoluted and a little too far. Hainan would obviously prefer to operate from Beijing, but it has potential to make Tianjin work. Its sister carrier Tianjin Airlines is based in its namesake city and is the largest carrier with about 21% of the market, slightly ahead of Air China. Tianjin in Jun-2015 is mostly a domestic operator with 95% of its seat capacity on domestic routes. From Tianjin, Tianjin Airlines uses a mixture of Airbus narrowbodies and Embrarer regional jets. Hainan Airlines will try to capture the demand around the greater Beijing/Tianjin area. Tianjin Airlines can provide some feed but there are limitations in terms of frequency, connection times and even cities served. A challenge for the HNA Group is to have greater synergies across its airlines, which tend to operate quite independent from each other. There are considerable synergies to be achieved, but it will need better central planning. Tianjin Airlines' top 10 routes from Tianjin are a mixture of second tier and smaller cities. Notably Shanghai is absent. Hainan Airlines has existing limited Shanghai-Tianjin service. Hainan will have the Tianjin-New York JFK service originate in Shanghai, allowing same-plane service from Shanghai to New York JFK. This could also help with aircraft rotation. Hainan's Tianjin base for North American services is one additional element of rapid growth in the trans-pacific market, and in particular to China. How much more growth can there be? Chinese visitors to the US reached 2.2 million in 2014 – a record. 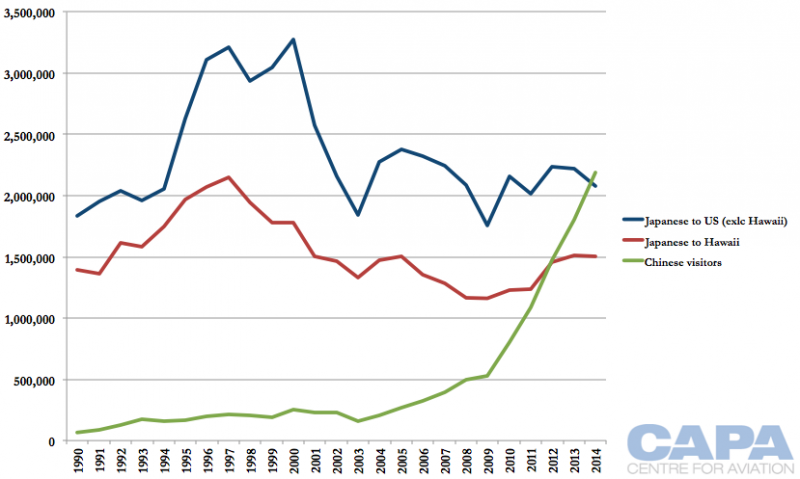 In comparison, the US' last Asian visitor boom was with Japan. Japanese visitors peaked in 2000 with 3.3 million visitors to the US, excluding Japanese who arrived to Hawaii. (Japanese visitors to Hawaii can be around two thirds to three quarters of Japanese visitors to all other parts of the US. 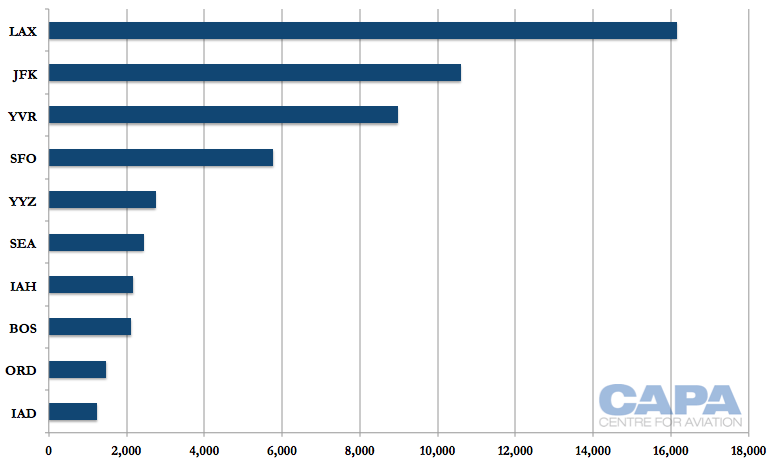 China does not have nearly as significant a visitor pool to Hawaii as Japan does.) 2014 was the first time Chinese visitors to the US surpassed the number of Japanese visiting parts of the US other than Hawaii. 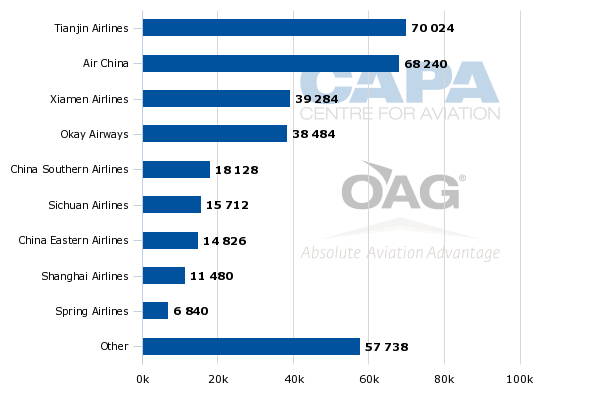 Given factors including the greater efficiency of aviation today than in Japan's 2000 peak in the US, and China's much larger population size, this is surely merely a taste of the enormous China-US growth that still awaits.